Adams County Head Start provides transportation to children who can be picked up and dropped off at a location that allows us to maintain a one-hour limit on our bus runs. Parents will be asked to transport their own children to a center, if the family lives or receives child care outside the bus routes. ​Our drivers all have the required Commercial Driver’s License (CDL) for school buses and proper endorsements to operate school buses in PA. Drivers receive random drug tests as required by law and ongoing training in safety and procedures that will ensure that their skills are up-to-date. If you are interested in receiving training to become a substitute bus driver, call our Transportation Supervisor at the Head Start office, (717) 337-1337, ext 245. Head Start provides transportation to some classrooms as a courtesy. Transportation is not a Head Start requirement. For classes that receive bus transportation, there may be times when parents/guardians will be required to provide transportation. You must provide the Transportation Office with the correct pick-up and drop-off addresses. You must also keep all contact information current with the office, including: addresses, telephone numbers, first and last names of any adult who is permitted to put your child on and off the school bus. If a person who is not on the contact form is at the bus stop, the bus driver will not release your child. Children who are unable to be delivered to an authorized adult will be taken back to the classroom, or to the central office in Gettysburg. If the child is not picked up at either location within an hour of class ending, Children and Youth Services will be contacted. 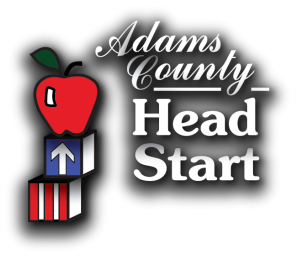 It is the responsibility of the parent/guardian to provide Adams County Head Start with any changes to pick-up or drop-off location, at least 3 days in advance. There are not guarantees that requested changes will be able to be accommodated. Please have your child ready and waiting for the bus at least 10 minutes before the scheduled arrival time in the morning. If your child is not ready on time, the bus will move on without them. If your child does not need bus service on any given day, you are required to inform the Transportation Office. If your child has not been on the bus for 3 consecutive days, and you have not contacted us, the bus will not stop for your child until you call the Transportation Office (337-1337, ext 245). No food, drinks, candy, gum, or toys are permitted on the bus. If your child needs to be given medication throughout the day while attending Head Start, notify the bus driver. The bus driver will allow you to put and retrieve the medication in the locked box on the bus. ​When boarding or exiting the bus, stay single file and hold onto the handrail. Stay out of the DANGER ZONE. Make sure all drawstrings, ties, straps and scarves are removed or shortened so that they do not catch in the bus doors or on railings. Follow pedestrian safety rules. Use sidewalks when available and cross at corners and crosswalks. First, walk 10 feet out beyond the front of the bus and make sure the driver can see you. Remember to always look left, right, and left again before crossing and continue to scan the road for traffic. Never run back to the bus, even if you have dropped or forgotten something. 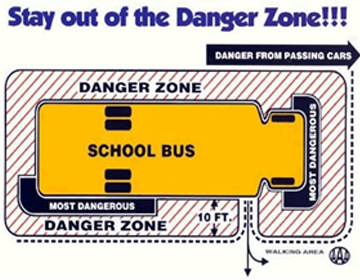 Parents must ensure that their children know and practice school bus safety. Children need to talk quietly while on the bus. If you would like to ride the bus to or from your child’s Head Start classroom, please call the Transportation Office ahead of time, (717) 337-1337 ext. 245. ​Allowing extra riders on the bus is based on available space. ​The bus drivers are in charge of the bus. The bus drivers have the right to adjust seating arrangements as necessary. ​Any infraction of safe bus riding will be documented in writing to the parent.